Valentine’s Day is a special day to spend with your significant other. A bottle of sparkling wine to sip together is a great way to cap, or start, the evening together. Below are 6 different sparkling wines that I tried over the last 12 months, from BC and overseas, that I think are exceptional. Enjoy these wines on their own, with an appetizer, your main course or dessert. Bella Sparkling Rosé, BC – I did not notice a year on the bottle, but I assume 2017. This wine they call Trad-Nat, which to me is a blend of traditional bottle ferment, such as is used for Champagne, together with Pétillant Naturel. Not quite sure how the two work together, but the result is excellent. My favourite wine of the tasting. This rosé wine is made from the Gamay Noir grape. Rich nose, with apples, apple skin and cider. Slightly off-dry with tiny creamy bubble. Flavours of red currants and cider. If you have ever tried a top quality Lambrusco, this sparkling wine reminds me of it. Recommended. 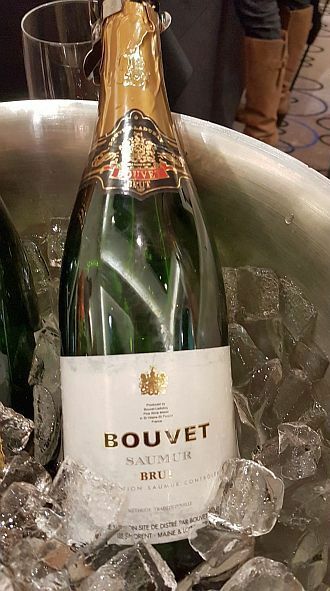 Bouvet Brut, NV, France – A cremant style sparkling wine made with 75% Chenin Blanc and 25% Chardonnay from the Loire Valley. It had a nice stone fruit nose. High acidity, medium-sized biting bubble, with ripe stone fruit flavour predominantly, together with some citrus. It finished with citrus rind flavour. Avanzi Romantica Franciacorta NV, Italy – This sparkling wine has a bready, citrus nose. Medium body, soft, medium bubble, off-dry. Apple flavours. Nice. Sommariva Conegliano Valdobbiadene Prosecco Superiore DOCG Brut NV, Italy – I noted that this wine had a toasty nose, which continued to the palate. Also on the palate, there was some nuttiness to the wine and flavour of baked apple. Creamy bubble. An elegant wine. I wondered about the toastiness as that is not what you would expect from Prosecco seeing that it is not aged in oak barrels. Stainless steel keeps the fresh fruitiness of Prosecco. The owner that I spoke with told me that their vineyard has iron in the soil and it is the iron that imparts the toastiness to the wine. Other vineyards producing Prosecco have more clay soils. A recommended wine. Upon review of my past tasting notes, I noticed this recommended sparkling wine, which I’d like to add for your pleasure. Bench 1775 Brut Rosé 2014, BC ($21.90) – A blend of 50% Chardonnay and 50% Pinot Noir. It has a light orange-copper colour with persistent tiny bubbles in the glass. It is youthful with light aromas of lees, red fruits and some leafiness. Nice and round, with tiny creamy bubbles, that do have a bit of a biting edge. Higher acidity, body, and flavour intensity. Tart red fruits primarily, with some minerality on the finish. Rating: A quality sparkling wine with red fruit flavours and tiny creamy bubbles.